DONNA — The Donna ISD police chief is out of a job — again. Three years after the school’s superintendent fired him the first time, Roy Padilla finds himself in a familiar position just a month after he was placed on suspension. Last Thursday, during a special board meeting, trustees terminated Padilla’s employment with the district. Padilla was terminated in executive session more than a month after he was placed on administrative suspension related to an internal personnel audit and an investigation conducted into the school district’s police department. Padilla, who was suspended May 12, declined to comment on the suspension at the time. Days after his termination, Padilla is appealing the board’s decision claiming he was wrongfully terminated and that the board violated the Texas Open Meetings Act by holding the discussions related to his termination in a closed session after he requested it be held in public. Donna ISD attorney Alyssa L. Romero, of the firm Guerra & Farah PLLC, released a statement regarding Padilla’s termination Wednesday afternoon. Romero, who confirmed Padilla’s suspension in May, declined at that time to elaborate on the specifics of the investigation into Padilla and the police department. But in the statement released Wednesday, the district mentions in broad terms at least some of the issues revealed during the audit. The statement, which confirms Padilla’s termination from the district, states violation of department policies as one of the issues found during the audit. Additionally, the audit revealed violations of court orders, violation of state laws and improper implementation of police department programs, according to the statement. Padilla has been through this before. In 2014, then-interim Superintendent Jesus Reyna — who had sole hiring and firing power over the district police chief — terminated Padilla during a May 14, 2014, board meeting. 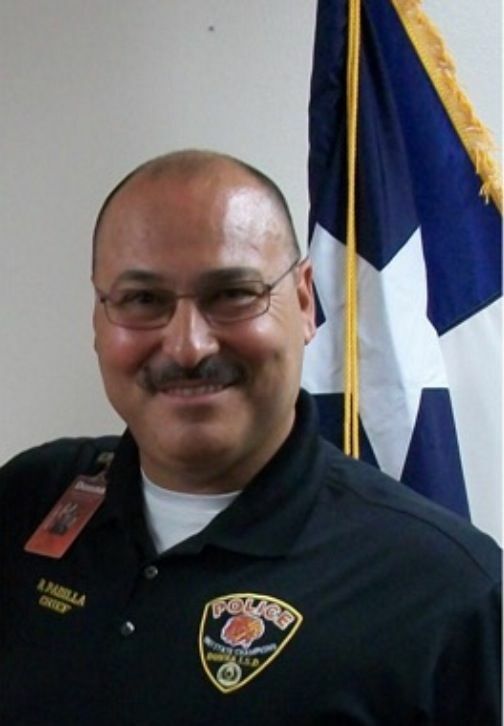 Padilla claimed then that he was fired from his position as district police chief because of politics — specifically that he refused to “babysit” a Donna school district police officer that he alleges had connections to local politiqueras . In September 2014, months after his termination, Padilla sued the school district for wrongful termination, seeking to be reinstated — a battle Padilla ultimately won when he was reinstated as the district’s police chief in December 2014. Now, nearly three years removed from that experience, Padilla sits in limbo. In a letter to the Donna ISD school board dated Monday and written by Padilla’s attorney, Richard W. Carter, the lawyer states that after Padilla’s suspension in early May his client received no other communication from the district about the results of the personnel audit that led to the suspension. “No other letter or written communication has been provided to Roy Padilla to give him notice the Personnel Audit has been completed, the findings of the Personnel Audit, or what complaint(s), if any, have been alleged against Padilla,” the letter states. Carter argues in the letter that Padilla should be reinstated to his former position, with back pay and damages included. Carter goes on to allege that by holding the special meeting in executive session his client was deprived of his right to decide to have the discussion on his termination be held in public. Padilla’s attorney says when Padilla was notified of the special meeting he immediately submitted a written letter requesting the hearing be held in public, a right Carter says Padilla has. But because the hearing was held in closed-door session, Carter argues the board’s decision should be void. “An action taken by a government body in violation of this chapter is voidable,” the letter states. Romero disputes Carter’s statement regarding the Texas Open Meetings statutes, saying the board acquiesced to Padilla’s request and did discuss the agenda item in “open” session. “Based on his request the district complied and that item was moved from “executive” to “open,” Romero said. She went on to add that neither Padilla nor Carter were present at the June 22 meeting. Finally, Carter calls on Hidalgo County District Attorney Ricardo Rodriguez Jr. and Texas Attorney General Ken Paxton to conduct an investigation to determine if any criminal charges or some other punishment might be appropriate for the alleged violations of the Texas Open Meetings Act. Padilla’s letter to the district. This story has been updated to add the school district’s response to the open meetings violation allegation.